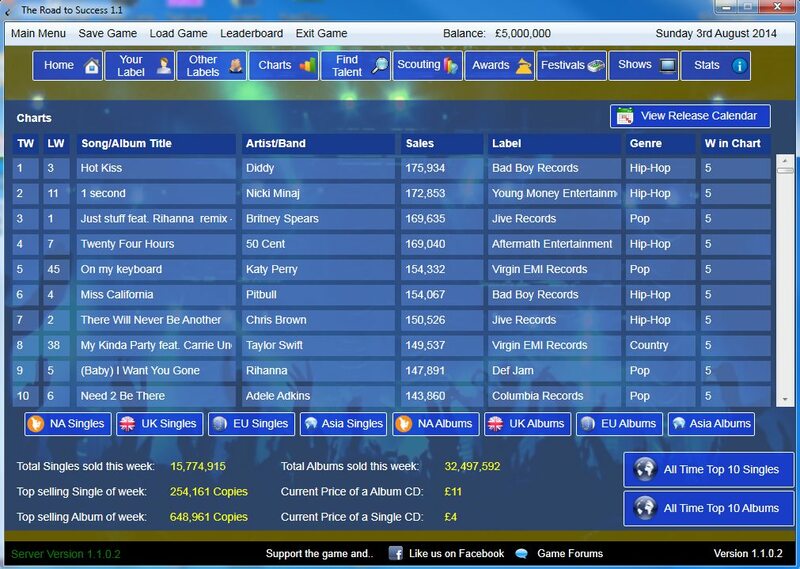 Run your very own record label in the Road 2 Success the new leader in Music label simulation games. Sign artists, send them on tour, help them release singles or albums and take them to the top of the charts. The Road 2 Success is a which puts you as the owner and Ceo of a Record label. Sign artists or bands and take them to the top of the charts. There is tones of features not limited to. Real writers/producers, arrange music videos and see them win video music awards. Send your artist on tour around the world in either huge stadiums to small bars whatever their reputation deserves. Get the band the practice their set before going out on tour and arrange merchandiser deals as well as marketing. Why not just before release that new single written by a world famous writer and get the top producer to produce the track in a top world class studio in LA, but dont forget the producer, writer and studio will all want a fee and maybe a cut. Realistic financial element means the artist will need to consider their options as they will loose some of their royalty if they use too many top class writers or producers. An editor also comes with the game which will allow you to edit most elements of the game and make your very own mod. The game is supported all year round with monthly updates allowing for more features to be added on a frequent basis and the developer will listen to all suggestions and a lot of whats coming to the game has been suggested by players already. Game support is offered through the games forums on the official site and any problems investigated by the developer promptly. After the dead start to rise, Funeraria Loca sees their funeral parlor business go down the tubes! Find a new way to put them to rest in Grave Mania: Undead Fever, an incredible Time Management game. Build your own beach resort! Begin in the 1920s with simple bungalows and reach unbelievable heights. Each level is a new year: wonderful art-deco hotels, the invention of the cinema, the first fast-food diner. Open up your very own roadside caf, and earn money, while treating your customers to delicious fruitcakes with different fillings in Cake Shop 2! Purchase advanced culinary equipment and begin to build your confectionery corporation. You?re the Cooking Academy valedictorian, on your way to culinary stardom in Cooking Academy: Restaurant Royale, the latest game in the popular Cooking Academy series! Compete in a kitchen showdown, creating mouthwatering dishes. This site does not contain serial number, crack, keygen The Road 2 Success serial number : serial number is the simplest type of crack. A serial number(cdkey,product key,etc) is register the program as you may already know. a crack or keygen may contain harmful software. If you cannot find the exact version you want, just give it a try. for more information read .nfo/.txt/.diz file include in zipped file.